Do not chemically strip FRESH PAINT. Fresh paint has not fully cross-linked, dried and hardened. Introducing any type of solvent to the surface and allowing it to dwell could have a negative effect on the paint. Note: The below article is NOT an official recommendation by Mike Phillips or Autogeek. It is an attempt to clear up any confusion on the topic of chemically stripping paint with the common products used for this procedure as discussed on detailing discussion forums by a handful of past forum members that were known for posting one-liners without any actual helpful or accurate information. If you choose to chemically strip your car's paint, or your customer's car paint, all the risk is yours. Anytime you use a new product or procedure, it's a great idea to first test in an inconspicuous area and check the results before moving forward. 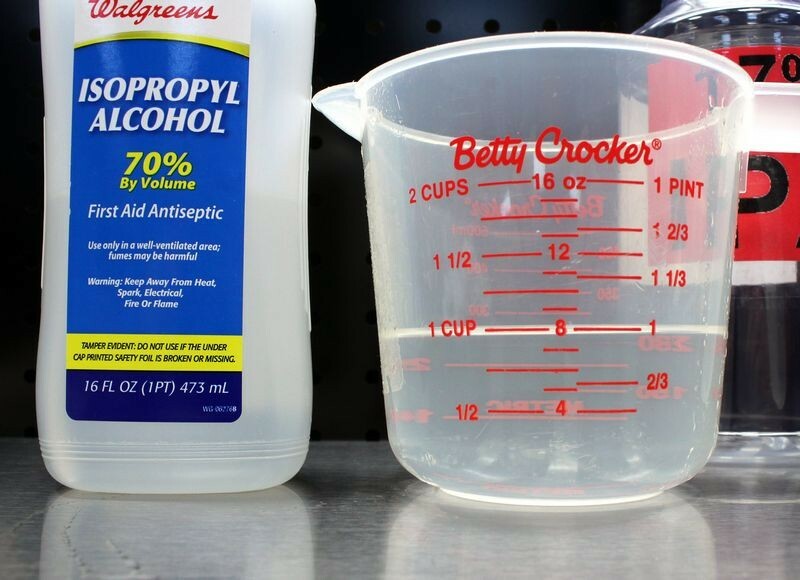 Here are the easiest ways to mix an approximate 10% solution for the most popular concentrations of Isopropyl Alcohol available at the retail level. 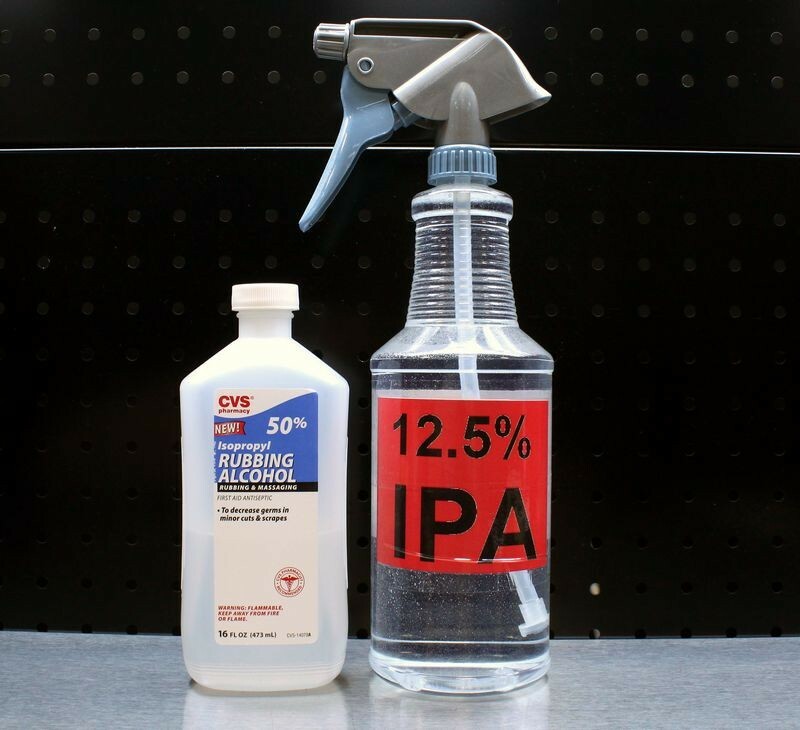 Pour 4 ounces or ¼ of a 16 ounce bottle of 91% IPA into a 32 ounce spray bottle and top the rest of the bottle off with water. This will make 32 ounces at 11.375% IPA to Water solution. 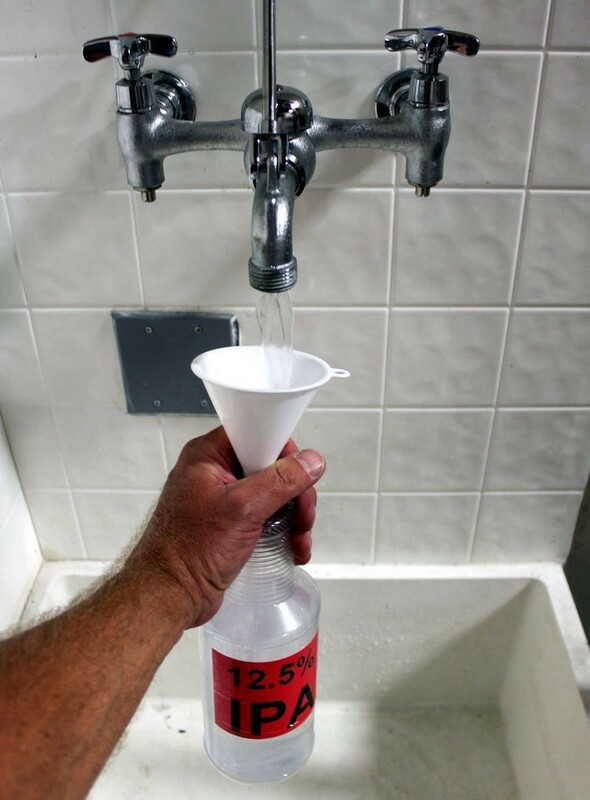 8 ounces (or ½ of a 16 ounce bottle) will make 32 ounce of 17.5% IPA to Water solution. 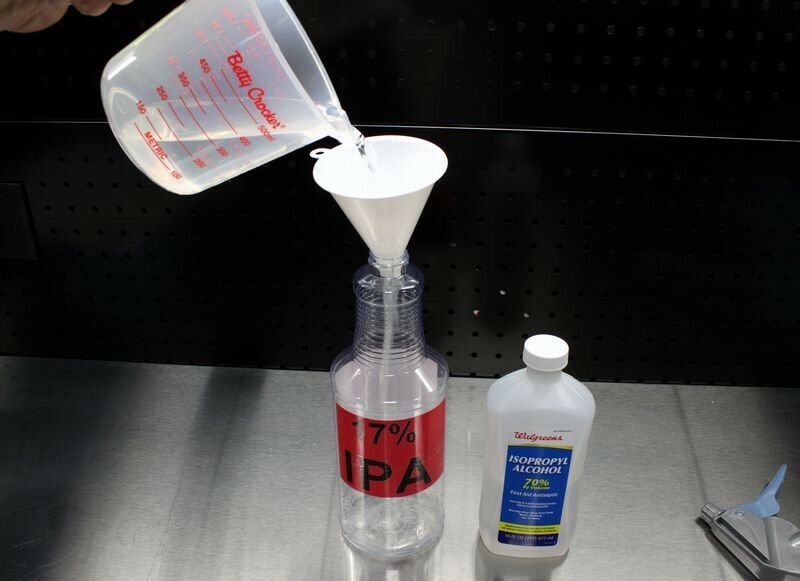 Get a 32 ounce container, pour in 8 ounces, (or ½ of a 16 ounce bottle) of the 70% IPA and then fill the rest of the container up with water and you get 32 ounces of 17.5% IPA to Water solution. 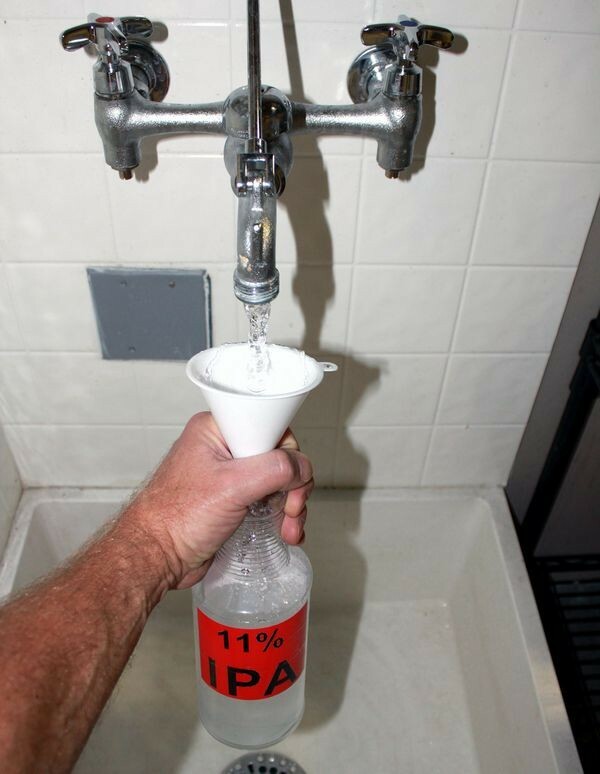 8 ounces, (or ½ of a 16 ounce bottle) will make 32 ounces of 12.5% IPA to Water solution. Get a 32 ounce container and pour in 8 ounces, (or ½ of a 16 ounce bottle) of the 50% IPA then fill the container up with water and you get 32 ounces of 12.5% solution. The most common dilution levels you can purchase over the counter are 70% and 91% Isopropyl Alcohol, sometimes you can find 50% version. At the time I'm writing this article, there are no other articles on this topic to give people a general guideline as to how to dilute and use Isopropyl Alcohol to chemically strip paint. I actually made a post to an AG forum thread where I encouraged someone else to write this article, but to date there's been no takers, so here's my offering. 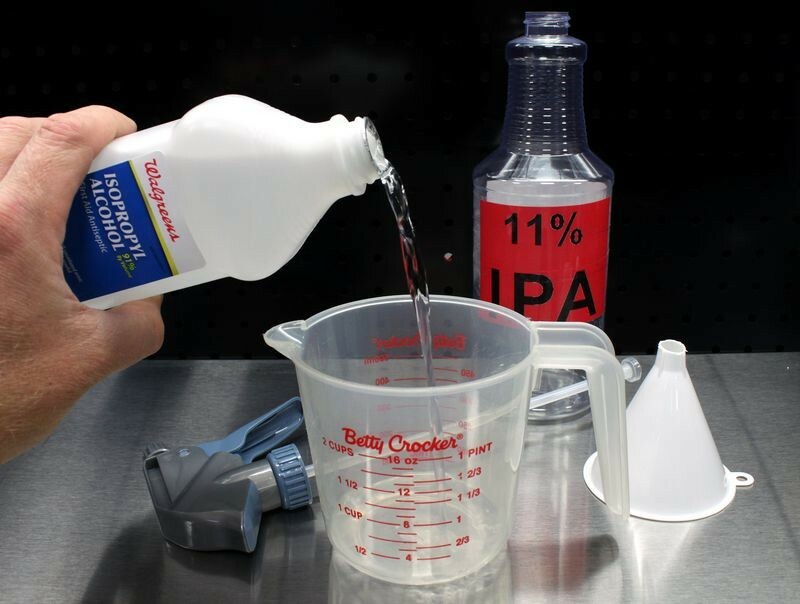 Diluting 91% IPA 1:1 or by 50% with water would give you approximately a 45% dilution of IPA to water solution. 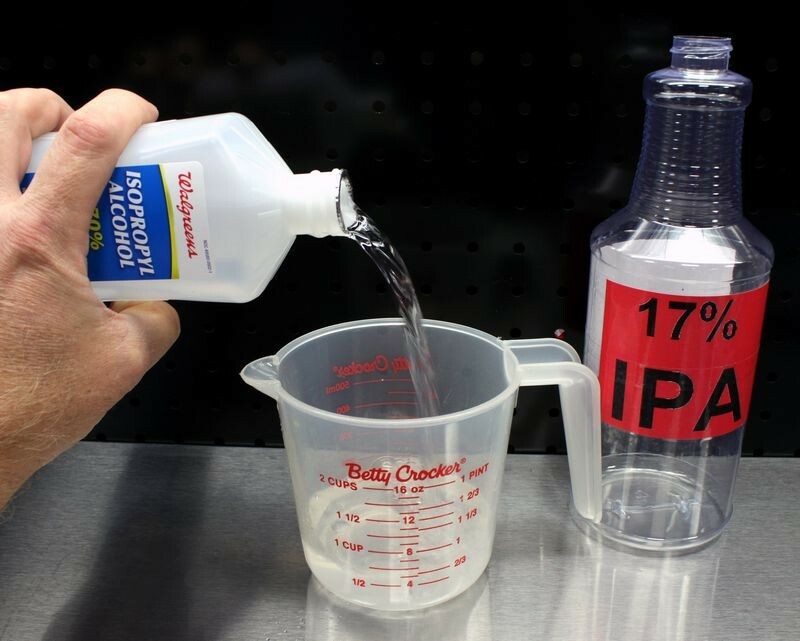 Diluting 70% IPA 1:1 or by 50% with water would give you approximately a 35% dilution of IPA to water solution. 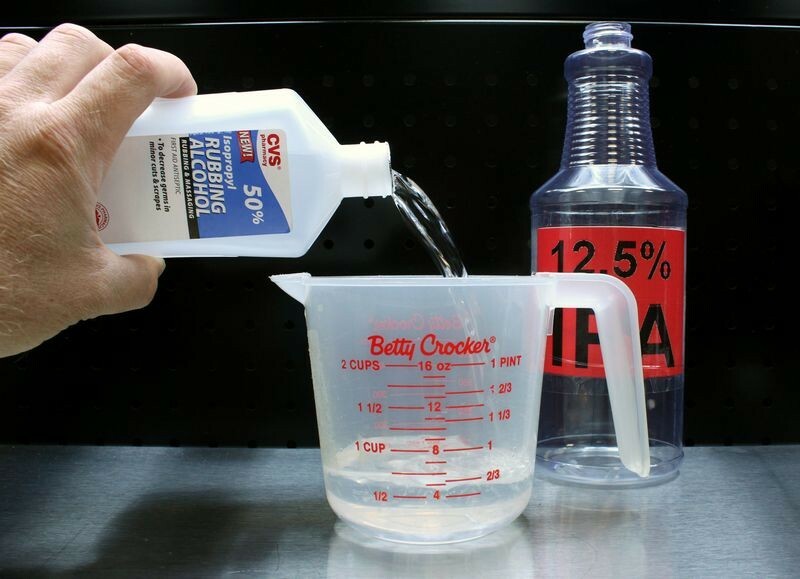 Diluting 50% IPA 1:1 or by 50% with water would give you approximately a 25% dilution of IPA to water solution. After talking to my chemist friends, they all felt that these dilution levels were overkill and too strong for removing residues after compounding and/or polishing paint. Most quality name brand compounds and polishes are water soluble and don't need a strong solution of Isopropyl Alcohol to dissolve, emulsify and loosen any leftover residues on the surface. Their recommendation was for approximately a 10% dilution of IPA to water solution. The reason for this recommendation besides their chemistry background, is that a strong solution of IPA can stain and even soften some clear coat paints. High Solids Clear Coats paints are "Alcohol Friendly", meaning products like Isopropyl Alcohol, can and will penetrated into, soften, wrinkle and/or stain the paint. To avoid any of these problems, a 10% dilution of IPA to water solution is recommended and adequate to remove any compounding and polishing residues without risking any danger to your car's paint or your customer's car's paint. Another colleague in the industry coined the term Hot to describe strong solutions of Isopropyl Alcohol used to chemically strip paint. Hot = How fast a liquid will bite into the paint, the strength of the dilution and the flash time for the liquid to evaporate off the finish. Full strength IPA is a HOT chemical stripper, the stronger the ratio, the hotter it is. My colleague agrees with my chemist friends that 50%, 70% and 91% dilution levels are all too strong to safely use to chemically strip paint. This person's recommendation was to stay at or below 25% dilution of IPA to water solution. Pump spray Glass Cleaners have been used for years as a convenient way to strip the finish to inspect correction results, often times because it's a commonly found product in a detailing environment. Most glass cleaners that use alcohol are around the 10% range or lower. 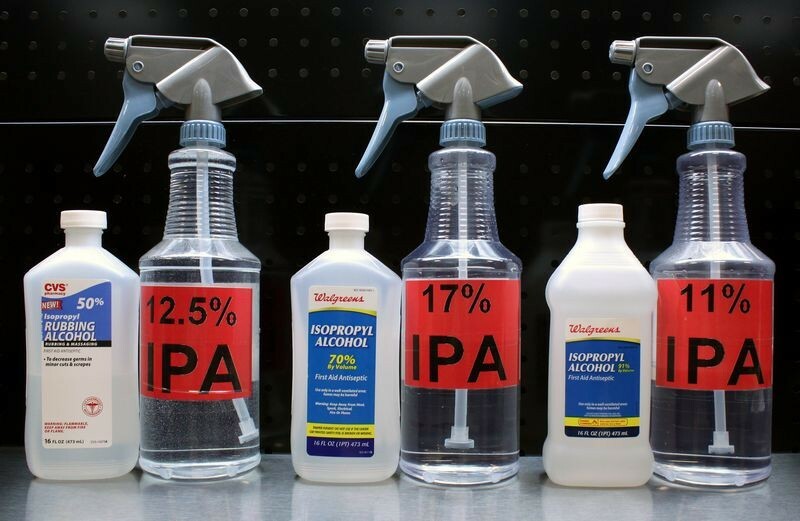 I'm guilty of using IPA straight out of the bottle at all dilution levels, that's because I'm not a chemist, and until I wrote this article and starting speaking with real chemists about this topic, I didn't know the risks involved. Not only have I made the mistake of using IPA straight out of the bottle, I've seen well intentioned forum members on multiple, multiple forums recommend this same practice. I'll step out on a limb here and propose that like me, a lot of forum members are not chemist and have not performed any in-depth research into this topic and their recommendation is just their personal opinion or they are parroting something they read posted by some other forum member that has also likely not performed any in-depth research into this topic. I don't want to ruffle any feathers, step on any toes or tell anyone they're wrong, so I'm just going to let the information I've shared in this article stand on its own. 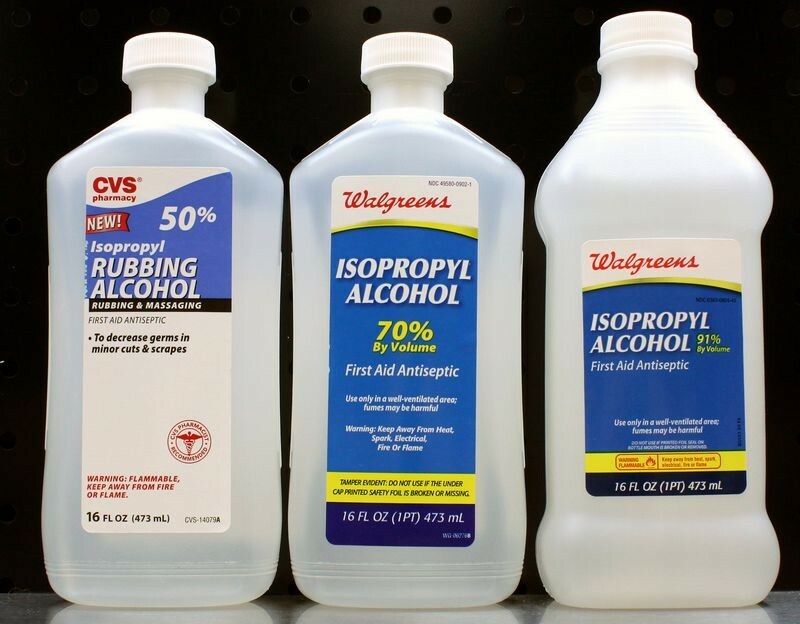 You, as the reader, can follow the recommendations I've presented or use Isopropyl Alcohol straight out of the bottle. It's your car, (or your customer's car), so do your own research, come to your own conclusion and then do as you will. In the last year, I used some 70% IPA to chemically strip paint while doing some polish comparison testing, and where I had used painter's tape to tape off specific sections for the test, after wiping the area with straight 70% IPA, some of the IPA penetrated between the tape and the paint and dwelled there while I continued testing. When I removed the tape, there was a visible place where the clear coat paint wrinkled-up from too long of exposure to the high concentration of IPA. 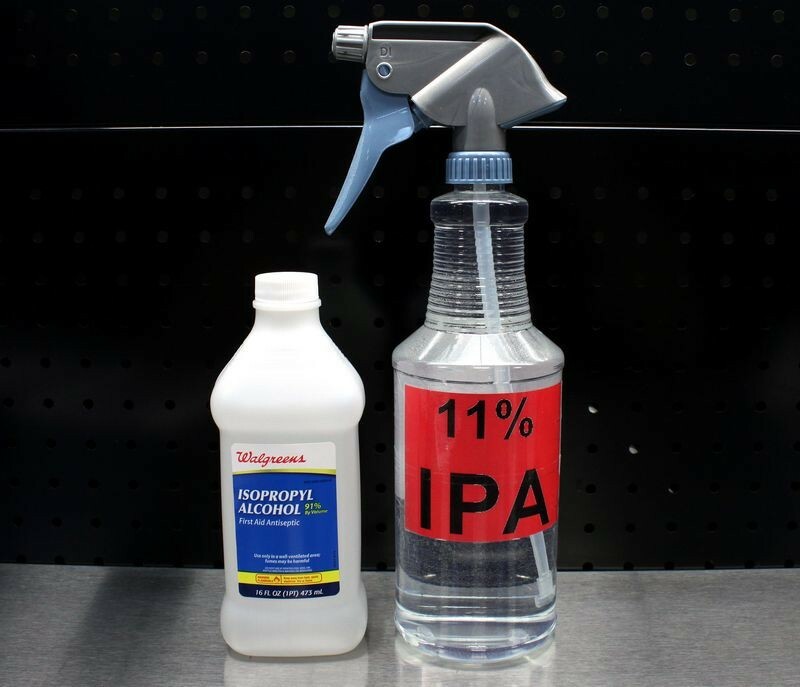 If you want to chemically strip paint to remove any compound or polish residues so that you can accurately see the true condition of the paint after any correction steps, then I recommend using approximately a 10% dilution of IPA to water solution. This is a safe approach to remove any residues masking the true results of your process to the paint without the risk of causing any harm. You can also opt to use Mineral Spirits instead as they will also remove compounding and polish residues. Theoretically, if your use IPA to chemically strip your Test Spot and after stripping and inspecting the results look good to your eyes, then theoretically if you duplicate the same correction process over the rest of the panels you will also remove all the defects and leave the same finish behind that you saw in your Test Spot. Assuming all the panels have the same type of paint, then you shouldn't have to continue stripping all the paint on each panel, just keep doing the same good work you did for your test spot and trust in your skills and ability. You can check each square inch as you work around the car to make sure you're doing as good of work over the rest of the car as you did in your test spot, that's an option and choice each person can make. I tend to check my Test Spot and if it looks good then simply repeat the process over the rest of the car and trust in my skill and ability to duplicate my process over and over again with little variation. 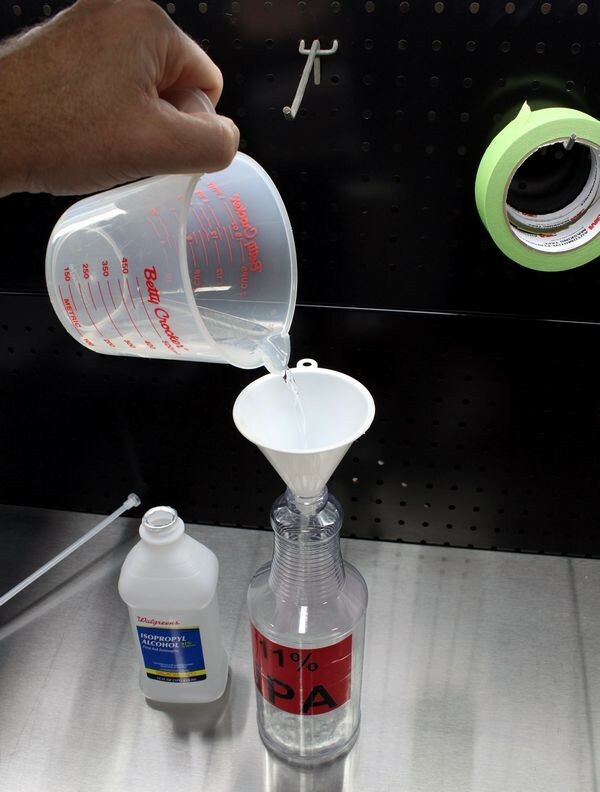 Note this article is addressing the dilution strength for removing compounding and/or polishing lubricating oils sometimes called fillers during the paint correction steps. You can also use this to try to remove any previously applied wax or paint sealant, but while I was speaking with one of my chemists friends about this topic they told me that Isopropyl Alcohol is not effective at removing some polymer products. If you're dead set on removing any previously applied wax or paint sealant by chemically stripping the paint, then a combination of using both a 10% solution of IPA to Water followed by wiping with Mineral Spirits should remove most, if not all, of any previously applied wax or paint sealant. To remove any previously applied wax or paint sealant, I recommend using a light paint cleaner or a light polish applied by hand or machine. A light paint cleaner or abrasive polish will effectively remove any previously applied wax or paint sealant AND leave the paint looking clear and glossy. I call this working forward in the process because the goal is to create beauty. Chemically stripping the paint will tend to dull the paint; it certainly doesn't increase gloss and clarity. You don't see the dulling effect unless you're working on black paint and repeat the process multiple times. Since not everyone works on black paint, and you're not going to make stripping your car's paint a daily routine, it could be you won't see the dulling effect on your car's paint but it does take place. Wiping a clear coated black finish over and over and over again with any type of solvent isn't going to make the top clear layer of paint more and more clear, it's going to do the opposite, that is dull it down. So chemically stripping paint is what I call working backwards in the process. I, personally, prefer to work forwards in all my detailing projects but do understand the reasons why some people want to chemically strip their car's paint, or their customer's car's paint, and each person can decide what the best approach is for their needs. And again, since you're not chemically stripping the paint as a "practice" but only during a detailing session, the dulling effect is not an issue, but I wanted to point it out just for the most detail oriented detailing enthusiasts or Pro Detailers reading this article. 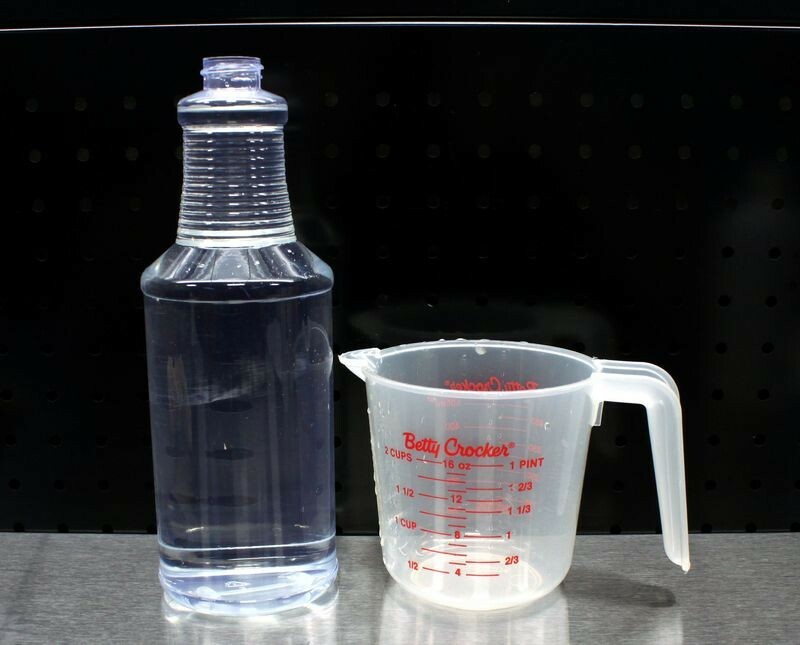 First, if you want to be exact or close to it, then confirm the size of your secondary spray bottle and the total volume of liquid it will hold. 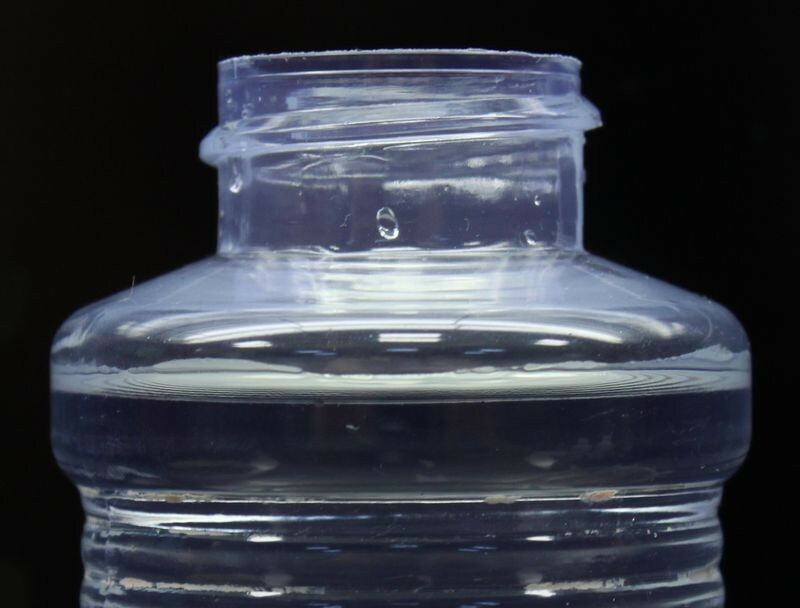 Bottles vary from manufacturer to manufacturer and sometimes a bottle rated for 32 ounces may actually hold more than 32 ounces. 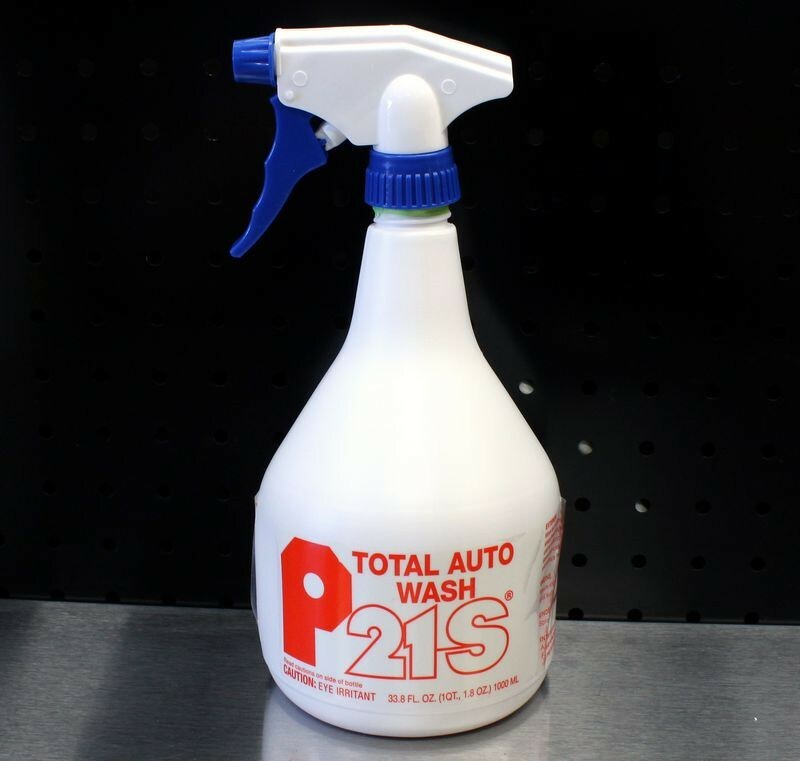 For this article, we are using the Autogeek 32 ounce Heavy Duty PVC Clear Spray Bottles. To verify the total volume of liquid they will hold, I measured out 32 ounces of water into the bottle. You can see in the pictures below that 32 ounces almost fills the bottle to the top with some breathing room for the suction tube that attaches to the spray head. 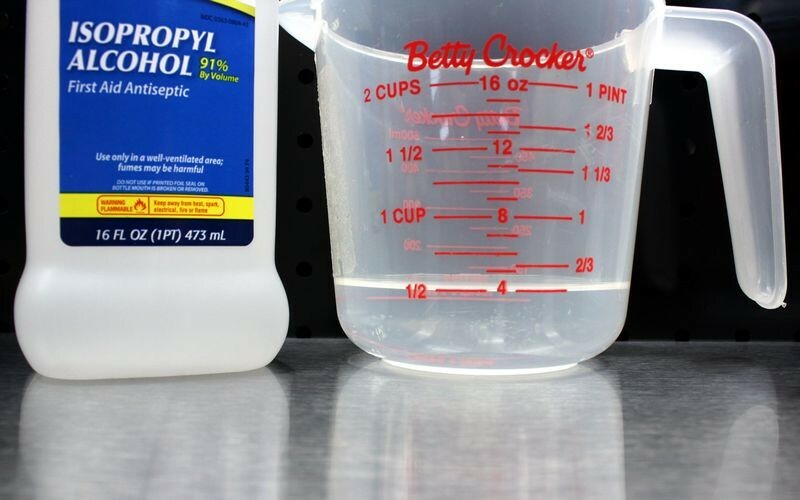 Now that we've confirmed the total volume of liquid our spray bottle holds, let's take a look at how to properly dilute the commonly available dilution strengths of over-the-counter bottles of Isopropyl Alcohol to water. 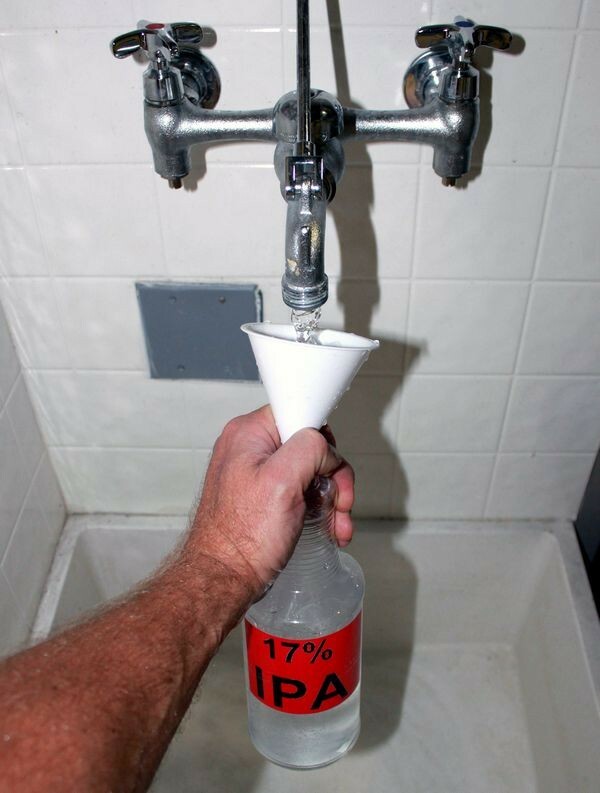 Pour 4 ounces, (or &#188; of a 16 ounce bottle), of 91% IPA into a 32 ounce spray bottle and top the rest of the bottle off with water. This will make 32 ounces at 11.375% IPA to Water solution. Fill the remainder of the bottle with a clean water source. You can as an option used distilled or purified water. 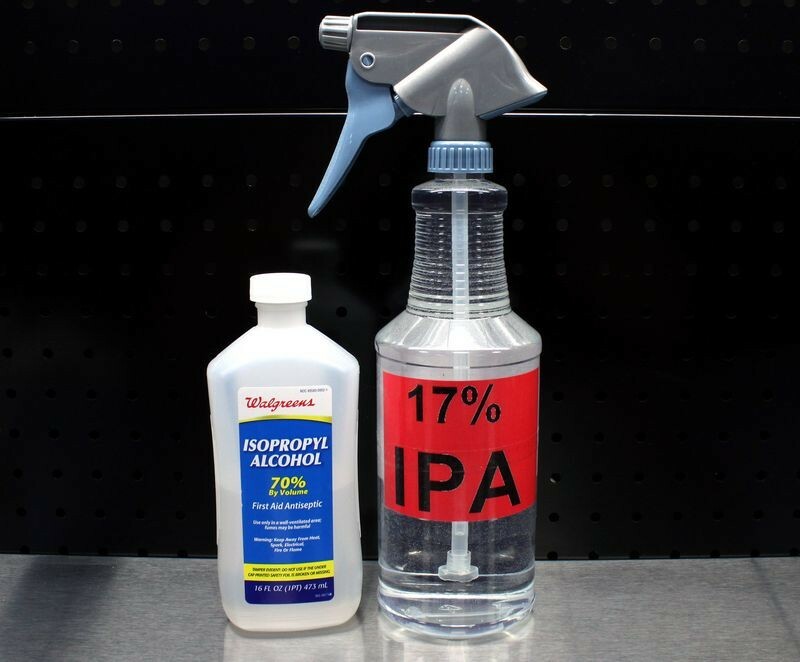 I know there are some people that will want a stronger solution of IPA to water ratio and it just so happens that the 70% Isopropyl Alcohol commonly found at the retail level is easily diluted for a stronger mixture than the 11% shown above. 8 ounce (or &#189; of a 16 ounce bottle) will make 32 ounce of 17.5% IPA to Water solution. 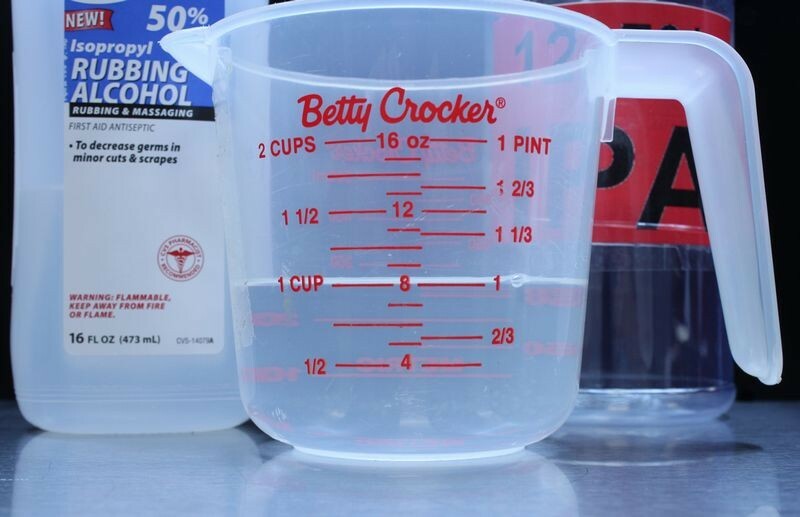 Get a 32 ounce container, pour in 8 ounces, (or &#189; of a 16 ounce bottle) of the 70% IPA and then fill the rest of the container up with water and you get 32 ounces of 17.5% IPA to Water solution. You can as an option used distilled or purified water. 8 ounces, (or &#189; of a 16 ounce bottle) will make 32 ounces of 12.5% IPA to Water solution. Get a 32 ounce container and pour in 8 ounces, (or &#189; of a 16 ounce bottle) of the 50% IPA then fill the container up with water and you get 32 ounces of 12.5% solution. Now fill the remainder of the bottle with a clean water source. 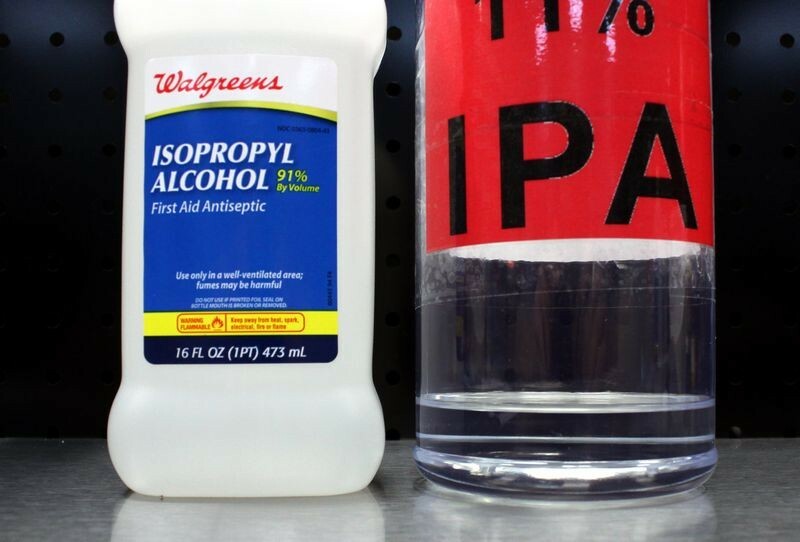 There you have three ways to mix IPA with Water to create your choice in the level of IPA to water solution using commonly found over-the-counter bottles of Isopropyl Alcohol. 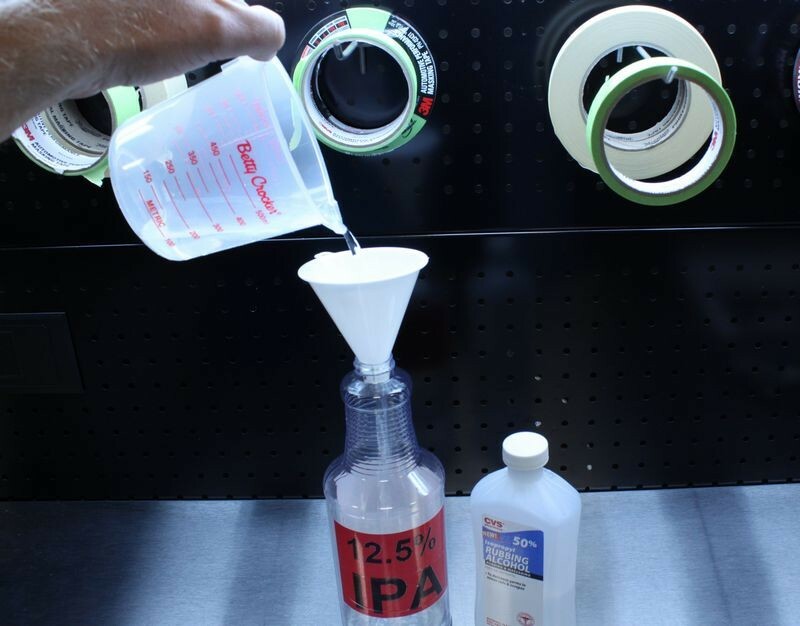 Now that you have a safe diluted mixture of IPA and water, if you want to check your work during any of the correction steps, (Compounding or Polishing), simply mist some of the IPA/Water onto the area to be checked and then spread around using a clean microfiber towel folded 4-ways. Work the product gently over the paint and then turn to a dry side and wipe till dry. If using IPA to remove previously applied wax or paint sealants, simply mist some of the IPA/Water onto the area to be checked and then spread around using a clean microfiber towel folded 4-ways. Work the product gently over the paint and then turn to a dry side and wipe till dry. Always wear the appropriate safety gear when working with chemicals. This would include safety glasses, protective gloves and a shop apron to prevent spills from getting on your clothes. Formulated specifically for removing compound and polish residues for inspecting correction results. 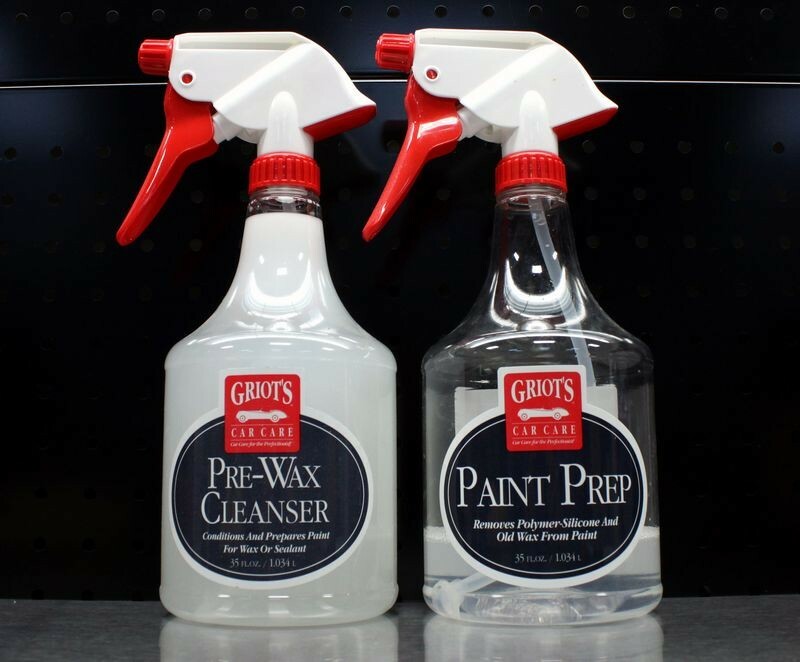 Formulated to be used after compounding and polishing to prepare the surface for wax or paint sealant. Formulated to remove previously applied waxes, silicones and oils either before doing any correction work with compounds and polishes, or before application of wax or paint sealant. Both of these products are sometimes recommended for stripping paint, but both manufacturers recommend that after applying these products, the paint should be rinsed with water to remove any residues. As such, they are not spray-on and then wipe-off products. 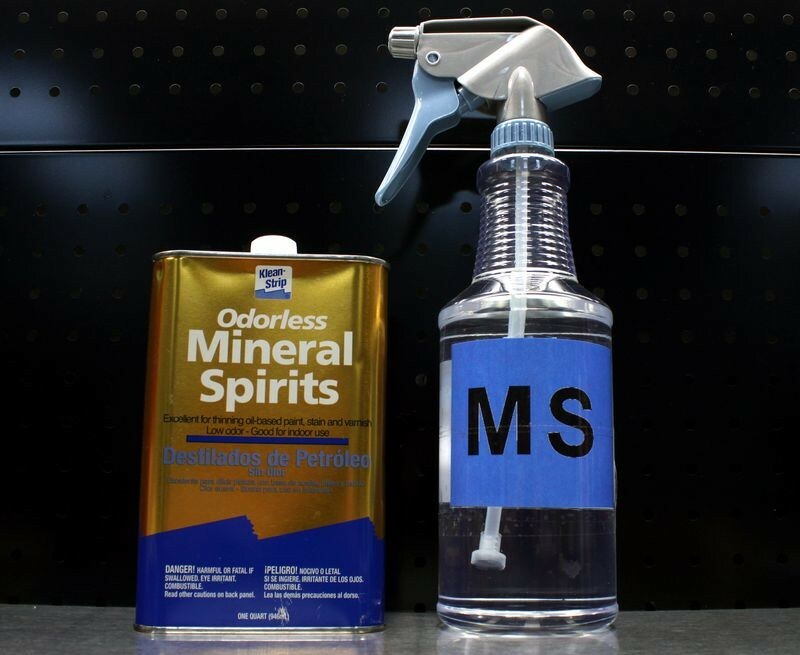 Mineral Spirits are another option for chemically stripping an automotive finish, from my discussions with chemists on this topic, odorless Mineral Spirits should be chosen as the process for removing the odors is actually removing a lot of nastier substances through further refining of the product. Mineral Spirits will tend to wipe easier than most other options and leave a more clear finish. 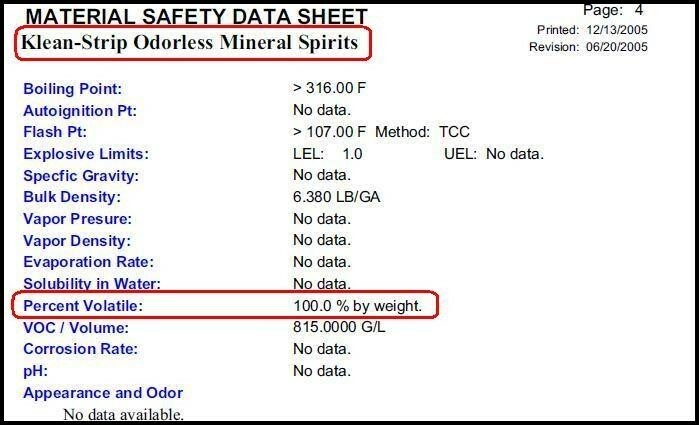 Here is the MSD Sheet for the Klean-Strip Odorless Mineral Spirits. I have circled the "Percent Volatile" percentage. My colleague stated that Mineral Spirits will tend to penetrate deeper into automotive paints, but it's safer than IPA. Again, DON'T chemically strip FRESH PAINT as it has not finished fully cross-linking, drying and hardening and you risk harming the paint. On the topic of using All Purpose Cleaners and/or Degreasers for chemically stripping paint, the consensus is that the more simple the product, (Products specifically formulated for this procedure or IPA or MS), are safer and preferred. 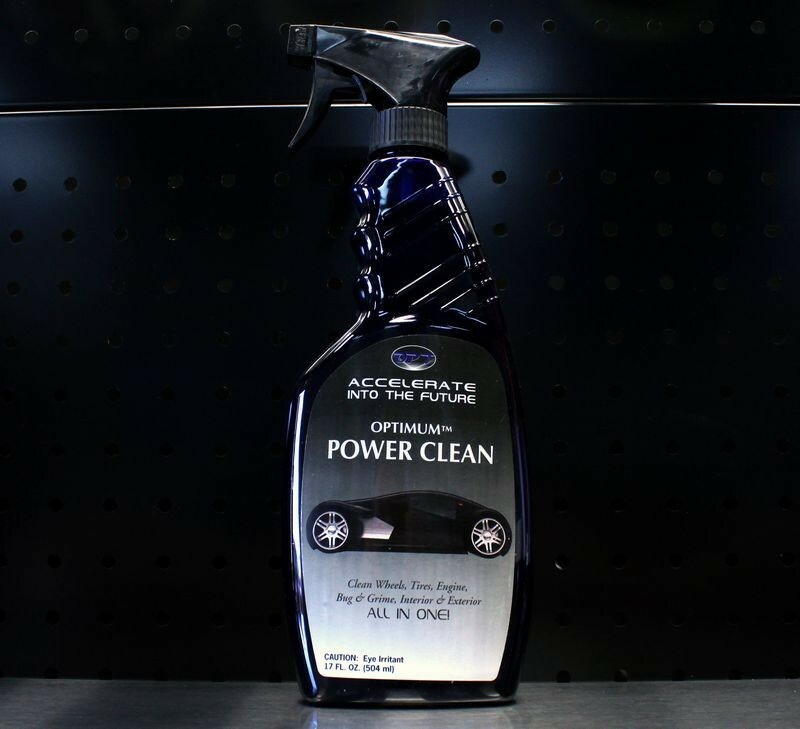 All Purpose Cleaners and Degreasers are more complex in their formulas in that theycontain more ingredients to give them the ability to clean or dissolve a wide spectrum of substances like grease, oil, road grime, etc. 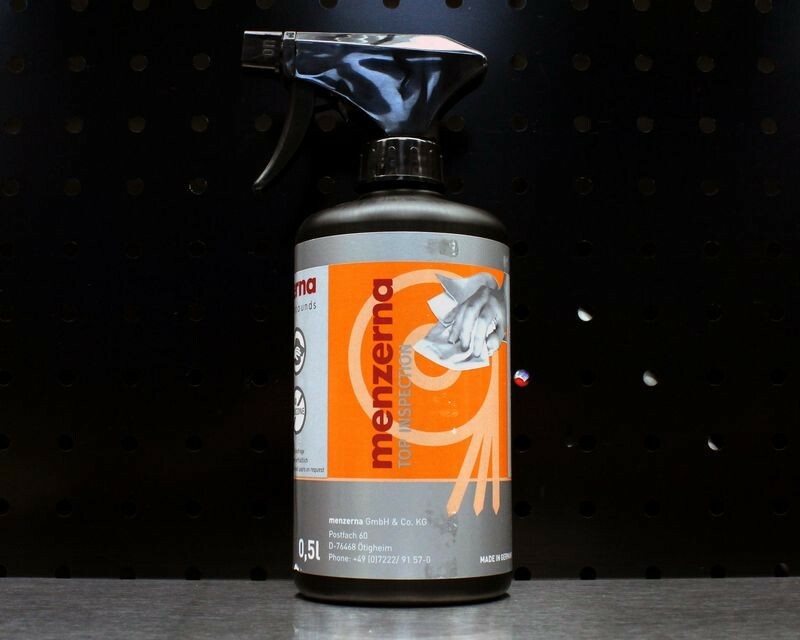 It's this expanded ability to dissolve a wide spectrum of substances that make All Purpose Cleaners and Degreasers excellent for cleaning things like engine compartments but for this same reason makes them riskier to use on a delicate, clear coat finish where they can stain or dull paint. Again, I wrote this article because it's a reoccurring topic on detailing discussion forums and I couldn't find any real substantial article on the topic or the process. I've done my best to make sure the information presented is correct to my knowledge. I tend to use a combination of all of the above, I don't have an allegiance to just a specific product or process, but instead which product I will use may depend upon what I'm trying to accomplish, or even simpler... what's closest to my hand at the time I'm working on a project. My personal opinion and habit is to use a light polish or paint cleaner to remove any previously applied waxes or paint sealants to get down to a fresh base. Not only will a quality light polish or paint cleaner effectively remove any previously applied wax or paint sealant, it will also create a clear, high gloss surface perfect for application of wax or paint sealant. This is what I call working forwards in the process. Detailing Clay is a type of polymer clay, think of a high-tech Play-Doh. What give detailing clay it's ability to remove Above Surface Bonded Contaminants is that detailing clay contains abrasives in the mix and the quantity and aggressiveness level of the abrasives can be varied to create either an Ultra Fine clay or an Aggressive clay. The way clay works is the abrasives act to abrade off any particulates sitting on the top surface of the paint, kind of like sandpaper would only a LOT more gentle and safe to the finish, when the clay is rubbed over paint with a lubricant. Instead of focusing on all the factors that determine if claying removes wax or paint sealant or not lets look at the big picture. Rubbing clay over paint doesn't "add" more wax or paint sealant to the surface. Question: What's the opposite of adding? So at a minimum, if you clay your car's finish, then in the big picture there's probably less wax or paint sealant on the surface than before you started. Make sense? Is all the wax or paint sealant removed? Probably not as paint is not totally flat, under a microscope the surface of paint has hills and valleys, pockets, pores and pinholes, and what we call interstices, which means microscopic cracks and fissures. Since the clay is only going to touch the upper surface of the paint and it's going to be gliding it over it, it's not likely that claying removes 100% of everything bonded to the paint, but it's completely logical that some portion of the wax coating or paint sealant is being removed. Claying shouldn't be counted on as a best practice for removing wax or paint sealant when there are better ways that are more effective. The point about claying and wax removal is that anytime you clay your car's paint, BECAUSE the potential exists to remove any previously applied wax or paint sealant, then it's a good "Best Practice" to at a minimum, re-apply a coating of wax or paint sealant to the clayed area to replace an replenish a coating of protection. Thanks to my friend John aka Perfections for suggesting I includes the topic of claying as it relates to removing previously applied wax or paint sealant as this topic mingles its way into the topic of the bigger topic of using a solvent to chemically strip paint. This was a somewhat tricky article to write and the goal is to simply help people to avoid mistakes when either inspecting their progress when doing correction work or removing any previously applied wax or paint sealant. I have added the 50% IPA mixing instructions and pictures. The 70% and 91% were pretty common and easy to find. I found the 50% IPA at a local CVS store. Some have commented that after reading the article they have decided that at least for their needs, using 91% straight IPA is too strong as well as 70% and 50% but wanted a ratio stronger than the approximate 10% ratio recommended by my chemists and experts in the paint care products and detailing industry. 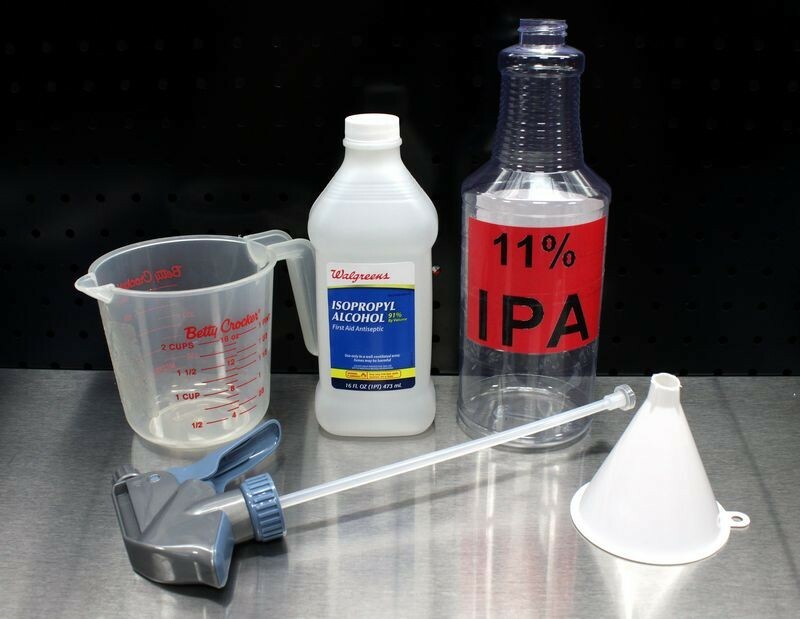 So if you want to create an approximate 20% dilution of IPA to water, you can add 7 ounces of 91% IPA to a 32 ounce bottle and then fill the rest of the bottle with clean water or distilled water. I prefer to mix IPA (91&#37 50/50 with water. 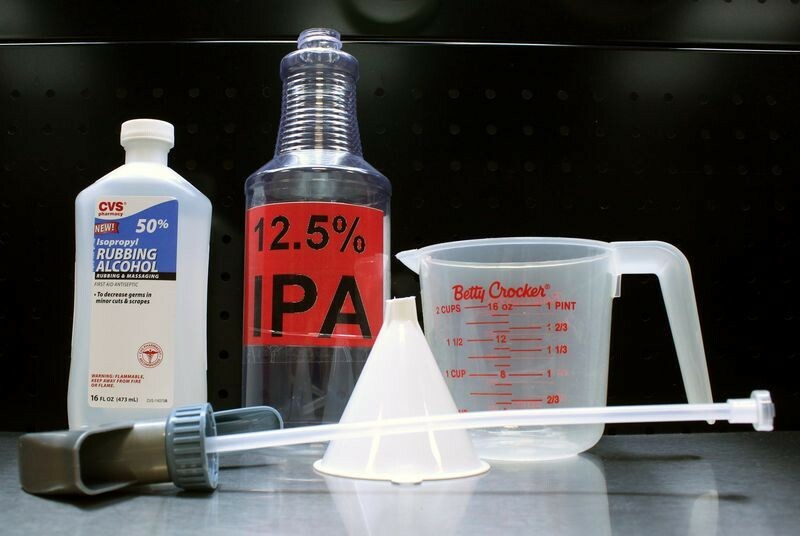 IPA is cheap enough and does a better job at cleaning than lower concentrations. I always remove all tape before using IPA. I prefer to mix IPA (91%) 50/50 with water. 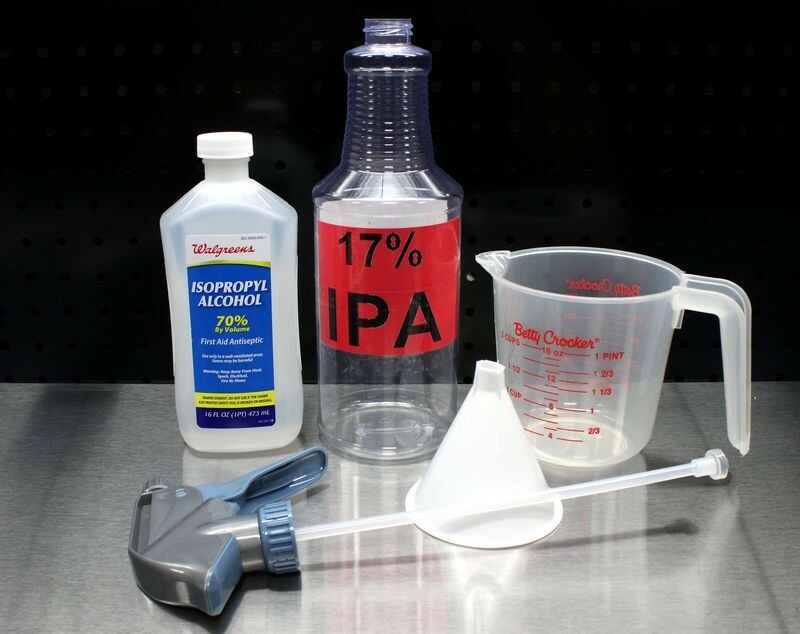 IPA is cheap enough and does a better job at cleaning than lower concentrations. Adding your tip about removing any tape is a good idea as the IPA wipe should remove any residual sticky residue... (for those that choose to wipe with IPA or some other option). M34 to check final correction results? First Correction - Poor Results - Any Advice? By Soulman1980 in forum Ask Mike Phillips your detailing questions!